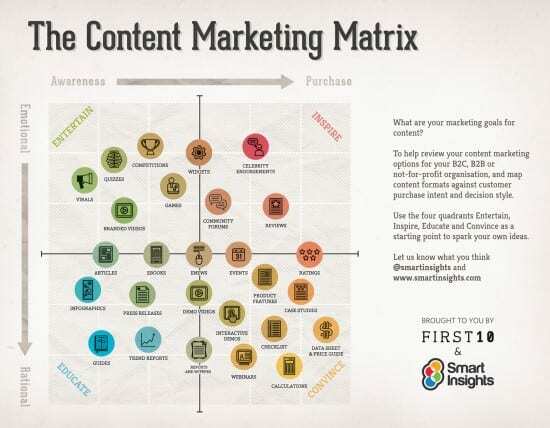 Last month Smart Insights released a really nice little matrix, categorising the most popular types of content marketing into four quarters, which I am reviewing this month. Last month Aaron Dicks of Impression Agency showed me a really nice little graph created by Smart Insights. The matrix categorised the most popular types of content marketing into one of four quarters, and considered ‘emotional vs rational’ and ‘awareness vs purchase’ factors. The first set of content formats cover the entertainment quarter. These mediums may be quite strongly biased towards a product or brand and contain a serious, humorous or informative message. Great examples include any of the videos that tend to go viral around the time of the superbowl, such as the recent Mercedes Benz viral chicken video. Whilst these pieces may not act to drive customers through the sales funnel, they do (at least intend to) increase positive brand association with the audience. Similarly to entertainment content, inspirational pieces may also contain a serious, humorous or informative message. Contrastingly however this content does aim to drive additional purchases through emotive messaging. Take for example some of the celebrity endorsements you often find promoting fashion or technology on Twitter. These tweets often positively reflect a product and result in a sudden increase of sales. Several positive reviews of a TV, book or laptop on Amazon are likely to influence sales rather than entertain the audience. The third quarter relates to educational content, which replaces emotional messaging with more rational and often factual messaging. These types of content are often less bias, and lend themselves well to raising awareness with the audience. Infographics are amongst the frontline of these educational pieces, and often demonstrate strong thought leadership in alternative ways to the readers. Whitepapers on the other hand often fall somewhere in the middle of the awareness or purchase weighting (as shown in the matrix). Finally there’s content produced in order to convince. This content, such as price guides and data sheets, mixes the rational approach of educational pieces with the purchase focus of inspirational content. The result is content aimed at directly selling a product, service or solution to the audience. It’s noticeable that the majority of content types falls within this category, and seem to be more readily adopted by B2B companies compared to Entertainment, inspirational and educational content which are much more commonly used across B2C organisations. Of cause there are exceptions, but perhaps one reason for this may be the directness of rational/purchase content types. Articles, Ebooks, events and ratings sit right in the middle of the emotional vs rational axis, whilst widgets, demonstration videos and white papers sit on the fence regarding awareness versus purchase. Interestingly, ENews has been placed smack bang in the middle, demonstrating it’s central approach across all the aforementioned factors. I’d tend to agree, but it would be interesting to know why articles has been put as contributing more awareness compared to ENews. Personally, I’d have put articles in the middle too, as it’s dependant on how they’re written. What do you think? Do you agree with the placements of the content types? And what types of content do you adopt at your company?